St Bede’s organ committee first contacted us in 1992 while we were constructing our 3rd instrument. 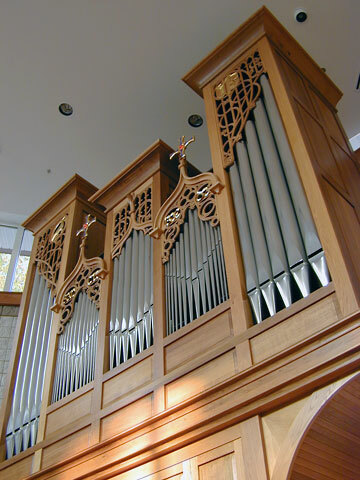 What started as a small organ for their 1960 parish hall/sanctuary, lead by then rector Rev. John Porter, became a campaign to build the long dreamt of permanent sanctuary. A fundraising campaign eventually established not only the new sanctuary but a new pipe organ as well. In consultation with organist Barbara Luhn, and current organist Tamara Albrecht, the concept evolved into a moderate two manual organ made as flexible as possible by combining both manuals on a single chest. This organ, though modest, still boasts a 16 foot manual voice as well as four 8 foot stops and a full compass string on manual II. Both manuals and pedal (save the Praestant 8, and pedal 16 foot stops) are all enclosed in a single swell box, thus enhancing its range of uses from congregational, to recital, to quiet accompaniment.